Sofas complete the look of your home decor. There are so many designs available in modern sofas today. From contemporary options to recliners, you can choose according to your space. You can also choose sofa bed for it not only saves on space but also serves as extra bedding option for your guests. There are many sofa bed designs in Singapore, you can choose from the best ones. Listed are some best modern sofa bed designs for living room, read on. Made from high-density foam, this is ideal for your modern living room decor. The solid wooden legs give it a sturdy support. Available in various color options, it looks good with any color combination. The sofa bed makes up for a perfect space for two people. You can open it when you need it and let it remain closed otherwise. It does not take up much space and that is the highlight of this sofa design. It’s an amazing folding sofa bed option for your living room. It’s not only compacts in size, but its design is also top notch. In fact, it does not look a bit like a sofa bed. It looks like a modern piece of the sofa with a sturdy finish. Its available in 5 different colors so you can select a sofa according to the color of your living room. It will complement any decor style to make your room look simply amazing. It’s perfect for small living room concept. It’s ideal in design and will certainly make your room look brighter with its style. It’s made of pure foam fabric, so it will last longer. This is the most popular sofa bed design in Singapore. It’s elegant and perfectly fits the need of contemporary style living room decor. The best part about this sofa design is its comfort. It’s so comfortable that you would love to sleep on the sofa daily. It’s designed keeping in mind complete body rejuvenation. This sofa style is compact and easy to clean so you do not have to worry about stains. The sofa bed can be folded when not in use and can be assembled according to your need. Audrey sofa bed is available in different colors so you can take your pick. Price wise too, it is economical. Not exactly a sofa bed, but this is a daybed that you can use for sleeping. In fact, it’s so comfortable that you would love to laze around on this sofa. It’s so elegant in design and its perfect for small spaces. You can use this sofa daybed as a decor piece along with your living room furniture. A futon is a piece of furniture which consists of a thin mattress on a low wooden frame… A futon style sofa bed transforms easily from seater to sleeper the futon frame is ultimate in functionality. Futons have become more comfortable & durable over the years. 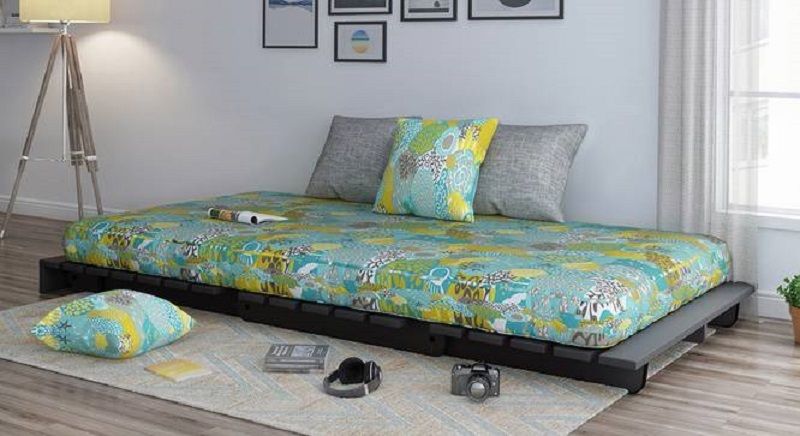 The unfurl sofa bed is ultra stylish and compact, allowing the sofa to work beautifully with your existing décor. It is a modern redesign of the old. It serves as a sofa during the day and as a bed at night. So, you would get extra sleeping and seating options. The frame structure is a tad different and its sturdy made from solid wood. You can simply enhance the decor of your living room with this elegant sofa style. Available in many different colors and size options, this one will up your decor game.